Dec. 1 — An arcane Labor Department office that enforces union disclosure requirements might be revived by Republican lawmakers eager to work with President-elect Donald Trump on unearthing labor corruption. The DOL’s Office of Labor-Management Standards has 44 percent fewer full-time employees than at its peak when George W. Bush was president. Early in the Obama administration, the department disbanded an OLMS division created under Bush specifically to audit large international unions. Discussions on the next administration’s union stance have been focused thus far on the U.S. Supreme Court and National Labor Relations Board. But the potential for a Republican DOL to impose stricter reporting mandates represents an overlooked effect of Trump’s victory on the labor movement. A Trump White House combined with GOP majorities in both chambers has some lawmakers feeling nostalgic. They are interested in an OLMS restoration. House Education and the Workforce Committee Republicans, who work with appropriators on setting DOL funding priorities, elaborated on Cole’s point, through a panel spokeswoman. Trump hasn’t gone out of his way to pick fights with unions of late. As a businessman, he has a mixed record of partnering and clashing with organized labor in the construction and hotel industries. Whether he returns the OLMS to “union boss” crackdown mode is an open question that could receive more clarity when Trump’s transition team announces a labor secretary nomination. The executive branch’s opinion may not matter because it could defer to a Congress more willing to extend resources to the office. Rather than a net spending hike, lawmakers could redirect funding from the Wage and Hour Division or Occupational Safety and Health Administration, which occurred under Bush. Renewed interest in the OLMS will need to compete with other priorities for the Trump DOL and upcoming Congress, such as unwinding a series of worker-friendly regulations finalized this year. But the relative ease of making such changes increases the odds that the office will soon conduct more rigorous oversight of union activity. President Barack Obama’s DOL hasn’t ignored complaints of union officer misconduct. The OLMS continues to enforce the Labor-Management Reporting Disclosure Act by responding to complaints of union official embezzlement and ballot-stuffing at union officer elections. “There was a fairly steady slate of union election cases” from this administration’s OLMS, Christopher Wilkinson, who provided the agency with legal counsel through 2015 as a DOL associate solicitor for labor-management, told Bloomberg BNA. “But what you can expect moving forward are some enhancements of resources for union election and embezzlement cases,” said Wilkinson, who now represents employers as a partner at Orrick, Herrington & Sutcliffe in Washington. The labor movement is already in agony over Trump’s ability to fill vacancies at the U.S. Supreme Court and National Labor Relations Board. The president-elect’s looming appointment of a new U.S. Supreme Court justice would damage unions’ treasuries by paving the way for a widely expected ruling that public employee unions can’t compel nonunion workers to pay fees to support collective bargaining. A fiscally strengthened OLMS would just be the latest blow for a movement already suffering from decades of membership declines and waning political influence. Unions are “looking at getting hammered on the front end on their ability to actually get union dues, and on the back end having OLMS look a lot more closely at what you’re doing with them,” Wilkinson said. 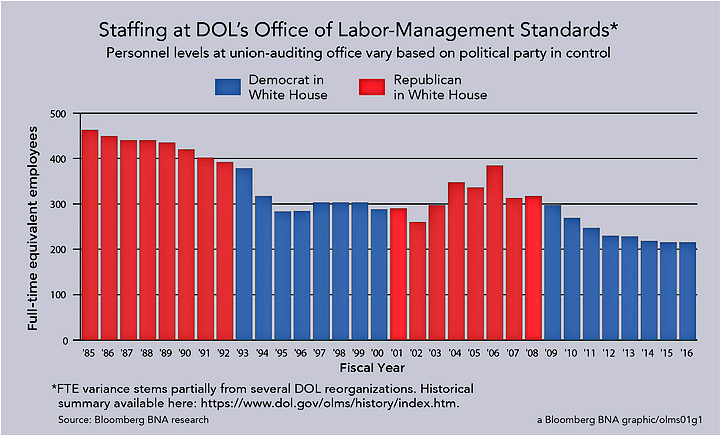 Joseph McCartin, a labor union historian at Georgetown University, told Bloomberg BNA that he would be surprised if Trump’s DOL didn’t escalate the level of record-keeping and paperwork mandates. “It just makes it that much more difficult because in many cases you’re not talking about an international union that has a lot of staff and can more easily meet these requirements,” McCartin said. “Sometimes you’re talking about locals with a paid staff of two to three people.” McCartin is executive director of Georgetown’s Kalmanovitz Initiative for Labor and the Working Poor, which develops strategies to improve workers’ lives. Another result could be union headquarters deciding it is no longer worth the risk of engaging in certain political activities, Anthony Carnevale, a former political director of the American Federation of State, County and Municipal Employees, told Bloomberg BNA. Heightened transparency of how members’ dues are spent is actually a good thing, Larry Cohen, who left his post in 2015 as president of the Communications Workers of America, told Bloomberg BNA. “My own view is that that kind of policing is fine. What’s not fine is ignoring what management consultants are doing, and ignoring the way in which management in the U.S. uses them,” Cohen said. In fact, for much of the Obama administration, the OLMS sought to address an LMRDA loophole that exempts employers from disclosing expenses on consultants hired to thwart union organizing drives. This resulted in the controversial “persuader” rule finalized this year, before a federal judge permanently blocked it. Trump’s transition hasn’t commented on how it will handle the legal defense of the rule, but attorneys are highly doubtful that it will be implemented. That leaves unions as the remaining major target of OLMS investigations under Trump. During Elaine Chao’s time as Bush’s labor secretary, Democrats and worker advocates criticized the OLMS for the low return-on-investment of combating union officer crime. Obama’s budget requests for the DOL have changed course, repeatedly requesting more funding for agencies like the WHD that investigate employers for violating wage laws. Nathan Mehrens, a senior political official at the OLMS in the Bush administration, told Bloomberg BNA that the climate in Washington is now ripe for at least an attempt to reinvigorate the small office, returning it to its previous capacity. “Given the small fiscal impact that bringing this office back up to, personnel-wise, what it was used to, I think that’s something to look for,” said Mehrens, who is now president of the advocacy organization Americans for Limited Government. —With assistance from Tyrone Richardson.